Using a chainsaw is very dangerous and unexpected accidents can happen all the time. In order to protect yourself, you should always wear chainsaw chaps to stop the fast-moving blades, which can cut through thick wood, cutting through you. Chainsaw chaps are designed to cover the fronts of your legs and calves which are the most common injury area when a chainsaw is concerned. Chainsaw chaps are not cut-proof but they are designed to slow down the speed of the chainsaw or to tangle the teeth of the blade, or even stop it from running. This is all dependent on the type of material used for the chaps as different materials have different qualities. If an accident does occur, the chainsaw might cut the outer layer of the chaps but will be stopped or wrapped up in the inner fiber layers. These inner layers are usually Kevlar, Polyester, Denier or Ballistics. These materials will give you the time to switch off the motor before any more damage happens. There are many different designs and features that come along with some of the best chaps on the market. Most chaps are made for those in the professional timber and logging industries, but it’s always advised to have a pair if you’re working in your back garden. The chaps you decide to buy with be made out of strong material which will work hard to keep the chainsaw from reaching the skin of your leg. The many different type and brands of chaps on the market can be intimidating and that is why we have produced a guide to help you. It’s important to research the best kind of chaps to get as many are designed for a specific purpose. Most are not made for electric chainsaws so be careful when looking for chaps if you own an electric chainsaw. Look through our guide of the best chaps on the market and ensure that you will be protected from your chainsaw should an accident occur. 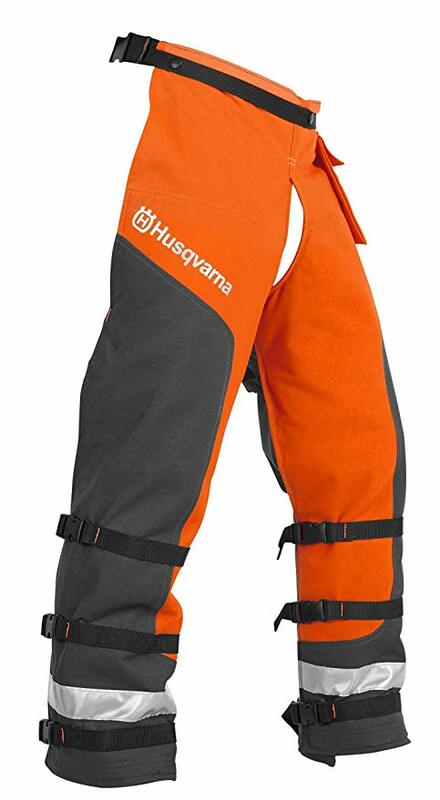 These Husqvarna chainsaw chaps are made by one of the top chainsaw manufacturers on the market, meaning you can be sure they are high-quality. From the people that know the industry and the machine, these chaps are available in grey/blue combinations and include UL certification. They also meet the ASTM F1897 and ANSI Z133.1 standards. This proves they are efficient and safe to use. To show that they have been proven to protect people from chainsaw accidents, these chaps meet the OSHA regulation 1910-266. It is also very easy to maintain as all you have to do in order to wash it is give it a hand-wash, hand dry, and then it’s ready for the next time you need them. These chaps work by using ballistic fibers inside the chaps material which quickly bind the chainsaw’s motor to make the blades stop working instantly. This way you will most likely walk away from the incident unharmed. The sizing of these chaps are one size but are adjustable which mean they will fit different people of different body sizes. Just remember if you’re on the exceptional tall or wide side, there might be some uncovered area where the chaps stop and your boots begin. These chaps do leave the backs of your legs unprotected, but this should not be an issue as it’s very difficult to cut the back of your thigh. These chaps come in different lengths of up to 36 inches along with a 6 x 6-inch pocket. They are a bright orange color to make sure you’re able to be seen and safe when working. They also meet the OSHA requirements which means you can rest easy knowing you’re using chaps that are completely safe while working your chainsaw. The Forester Chain Saw Apron with Pockets is very durable, and this is what defines these chaps. The material is made of 1200 Denier and the outer shell is water- and oil-resistant. This means you get a lot of protection from accidents you might not see coming. Along with these features are the 12-layers of material they incorporate for even more added protection. These chaps can fit a waist from 28-48 inches which means it can help protect those of all body types and sizes. One very important feature is the pocket which is not usually seen on chainsaw chaps, especially those currently on the market. This pocket can help you to store extra tools while still making them easily accessible while you’re working. These chaps are designed to not limit your movement, unlike most chainsaw chaps. You can still move around freely and comfortably as you work. Despite the comfort and freedom these chaps give you, this does not limit its protective power and will still keep you extremely safe. These chaps will fit people with the measurements of 36-38 inches. They are made of Denier and PVC coated materials as well as Tek Warp which is extremely durable and used as the protective layer. These materials are cut-resistant which will pull apart or clog your chainsaws sprocket system when an accident nearly occurs. This will slow down and stop the rotating of your chainsaw in order to prevent possible dangers. Another feature of this product is the convenient pockets it incorporates. This means you can carry extra items and make them more accessible to you while you are working. 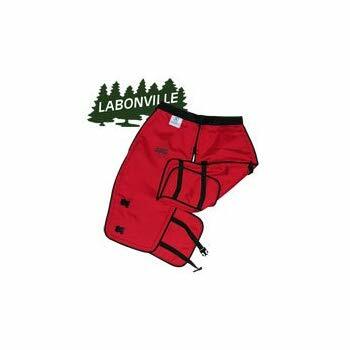 This, along with the adjustable waistline, makes these chaps perfect for different types of chainsaw operators. The buckles are Acetyl Delran bucks which make sure that the chaps fit you properly while adding extra security. The chaps also come with a UL certification and also meet the standards set by OSHA 1920-266, ANSI Z133.5, and ASTM F1897. These chaps are very durable and give you a great deal of protection while you work with your chainsaw. The materials are cut-resistant and effectively stop the blades of your chainsaw from causing fatal injuries to your body. This is helped by the fact that these chaps wrap all the way around your legs, rather than just covering the front. This ensures that you are fully protected from all angles. These chaps are custom made and high-quality and are used by logging businesses all across the country. 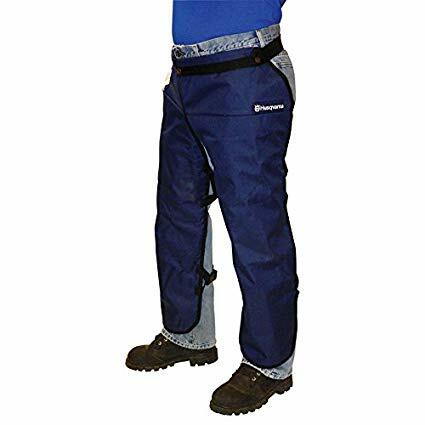 They are popular because they are thick, and durable, while also being full-wrap chaps which mean all of your legs are protected from the chainsaw, even the odd angles. These chaps are also reversible so if you feel the need to change things up, you can. These chaps also meet the OSHA standards. They can be produced in four sizes, so you be assured that you will have the perfect fit and they will be more comfortable than those that just come in one size. In order to estimate the chap length you will need, it is recommended to measure from your belt buckle to your boot laces. Your legs also get longer as they bend, so add a couple of inches to ensure true comfort and control. These chaps come in an extra long size. These chaps are made of ballistic weave technology which stops the chainsaw motor as it connects with them, keeping you from injuring yourself, or reducing the severity of the injury. These chaps have four layers of a Kevlar and Polyester blend which makes the chaps much more comfortable than if it was made entirely of Kevlar, but still gives the full benefits of the Kevlar material. This works by the chainsaw getting entangled in the material and disrupting its operation. These chaps are great options if you are looking for affordable chaps with high-quality protection. These are a very affordable pair of chaps, much more so than the premium brands like Husqvarna and Forester. This does not, however, mean that you will be sacrificing your safety as they are still of high-quality material and work to keep you protected from the dangers of your chainsaw. They are made of Kevlar protection, which if you didn’t already know if used for bulletproof vests that the police wear when they are in a line of fire. This means that this material is strong enough to absorb the force and shock of a bullet, and so must be as effective when protecting you from the rotating sheers on your chainsaw. These chaps are also covered in a high-quality polyester which is water-proof, so you can work safely and comfortably. The polyester material is also very durable and won’t lose color even after a long time. These chaps are also available in different size, and as we all know, we are all different shapes and sizes. This is a huge benefit of having chaps that fit your size perfectly can help to protect you while making you much more comfortable. The Woodland Pro Chaps come in four different sizes and include straps which are adjustable, so you can even tweak them once they are on to make them more comfortable and ensure you can move around with ease. Type of Chainsaw — the type of chainsaw you use should be considered when buying chaps as you will need the specific protection. Most chaps on the market are not able to withstand blows from electric chainsaws so you will need to do some extensive research when buying chaps for an electric chainsaw to make sure you have the protection you need. The Material of the Chaps — The different chaps on the market are all made of different materials. While the most common are Kevlar, Ballistic, Polyester, and Denier, these materials have differing strengths. Some of these materials can only be hand washed and other can use a washing machine, while others cannot be washed at all due to the damaging of the protective fibers. Comfort — You should consider the size, weight, and breathability of the chaps you are planning on purchasing. You need enough room to move around but a good enough fit to protect yourself from a range of angles. The weight of the chaps should be manageable as well, as this can hinder your movements. The breathability factor is also important as you may be working on a hot day, and thick, all-round cover, can make you very uncomfortable in the heat. Durability — This is important as the longer they last the better. It is recommended to look for chaps and brands that are known for their strength. You want chaps where the protective material will not deteriorate over time. Design — While protection is the ultimate goal when purchasing chaps, looking at the design can also help. 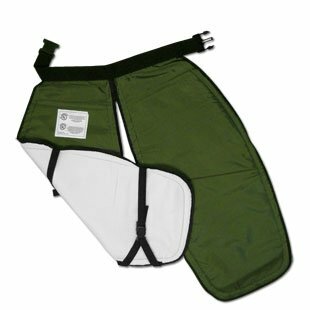 You could consider whether you need pockets or the ability to adjust the straps or a broad range of sizes. Certification — This will ensure that the chaps you purchase are indeed as protective and strong as they claim. The bodies which certify these chaps are the UL, ASNI, ASTM, and OSHA. With these certifications, you can rest easy they have been tested and have proven strength and durability. There are many benefits to using chainsaw chaps rather than chainsaw pants. There is, of course, the obvious benefit that you might reduce the risk of having a severed leg but aside from this, there are others to consider. Flexibility — Chainsaw chaps are easier to put on and remove which means you can take them off during breaks from using your chainsaw. This means you can cool off and relax more easily than if you wore chainsaw pants. Cooler — Some chainsaw pants are open in the back of the legs, which makes it much cooler for you to work. This makes working much more comfortable and less strenuous. Having a breeze on the backs of your legs, especially in sweltering weather can be the difference between feeling like you might pass out from heat and feeling comfortable. More Affordable — Chaps are more affordable than other chainsaws protective clothing due to it being less material. Occasional Use — Chainsaw chaps are perfect for those who only need them for occasional use as they are so easy to put on and take off. Different Versions — You have the ability to choose between apron versions and full wrap version. This means you can decide on the level of protection you need depending on the job you need the chaps for. In conclusion, chainsaw chaps are a very important item of clothing to have and to purchase as it can be the difference between having a severe injury or not being injured at all. Chaps are a protective layer against the dangers of chainsaws and work with their special feature like the protective material to stop or reduce your injuries. In this guide we have told you which chaps are the best on the market at the moment, so you have the option of choosing which is best for you. All the chaps mentioned are tried and tested and have assured protection. So, whether you choose the Husqvarna 531309565 Chain Saw Apron Chaps due to its ability to protect against electric chainsaws and the many standards that they meet, or the Labonville Full-Wrap Chain Saw Safety Chaps for their comfort and movability, and their bullet-proof like Kevlar protection, we are sure you will remain safe while operating your chainsaw in these chaps. We have also discussed the things you should consider before buying your chaps as these points are very important in order for you to get the best chaps for the job you need. 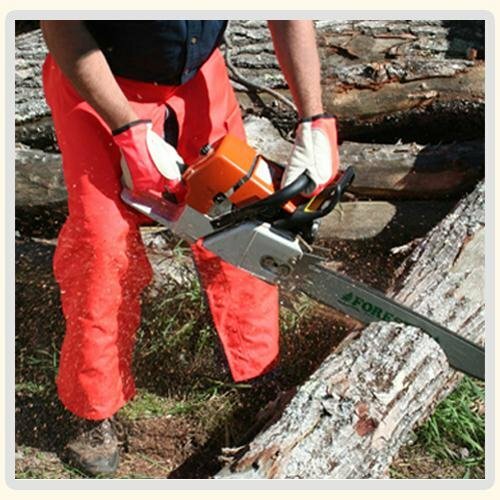 Keep in mind the type of chainsaw you use, the material of chaps that you need, the comfort level you might require, the durability of the chaps you might purchase, the design needs, and, the most important, the certification that is needed to prove to you the chaps are protective enough. Finally, we have outlined the benefits of using chaps. The obvious one, of course, is the protection they will grant you from the chainsaw causing you a serious injury, but there are others. Other protective clothing for chainsaws might not be able to give you the freedom and movement you might require for the jobs at hand. You might need the ability to stay cool where you are working, whether it’s just the climate of the area or a particularly hot day. You might be on a slight budget and need protection that doesn’t break the bank. Whatever the reason for buying chainsaw chaps, we hope this guide has helped you narrow your search for the best products. How long can these chaps last? How many times can you use them? Are they durable? It basically depends on how you use you them and under what conditions they are used. But regardless of the conditions, it can be used several hundred times without any trouble. Yes, they are durable you can use them for years. Hope we cleared your doubts. Thank you. Are these chaps really important? Seems useless. Sorry, but we have to disagree with you. Chaps are extremely important. Using a chainsaw is very dangerous and unexpected accidents can happen at any time. These chaps are designed to slow down the speed of the chainsaw and reduce the damage. Serious injuries can be caused if the use of chaps is neglected. Do consider buying one and save yourself from life effecting injuries. Thank you.